The handmade Rectangular Black Marble Top Dining Table is made by artisan Sajeel. No Colors Used, All You are admiring is natural semi-precious stones. This Pietra Dura Marble Inlay table top is a replica of ancient Italian Design is of 214 x 122 cms are molded and polished. 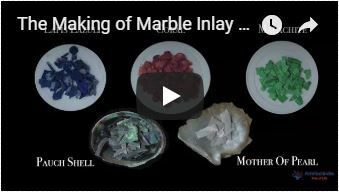 Different types of semiprecious and rare color stones like Carnelian, Lapislazuli, Malachite, Mother of Pearl, Paua Shell and Turquoise used to inlay. It can be used as a Dining Table, Guest table, coffee table, center table top in show room as well as a gift for your loved ones. The Rectangular Black Marble Top Dining Table is made in Agra India & fully handmade. This marble table illuminates if the light arrangement is made under the table top. The Dining Table Top will be delivered by FedEx or DHL free of cost door to door. If there is any Local Tax Custom Duties or VAT will be paid by the buyer at the destination. To maintain the table top is simple soap & water & dry cotton cloth. It is an art piece which will be a beauty & the conversation piece at home.